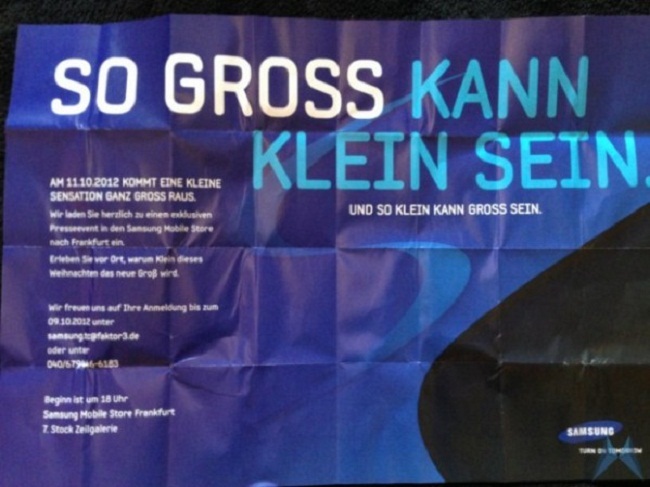 Today, Samsung Germany has started to send out invites to the press for a special announcement that many are assuming to be for the Galaxy S3 Mini. The Mini, which was first rumored in August, is said to sport the same overall look of the Galaxy S3, but come in a 4″ form factor and be powered by Jelly Bean and a dual-core processor. As for invite itself, it most certainly pokes at the idea of a Galaxy S3 Mini. Something small will be really big. Get ready for a little sensation. As for this thing coming to the States, there’s no word yet. We’ll have to wait until the 11th to find out anymore info. Would be kind of nice to see this phone in a smaller variant possibly.